The PT2500 E is the ideal solution for cost-conscious laboratories. 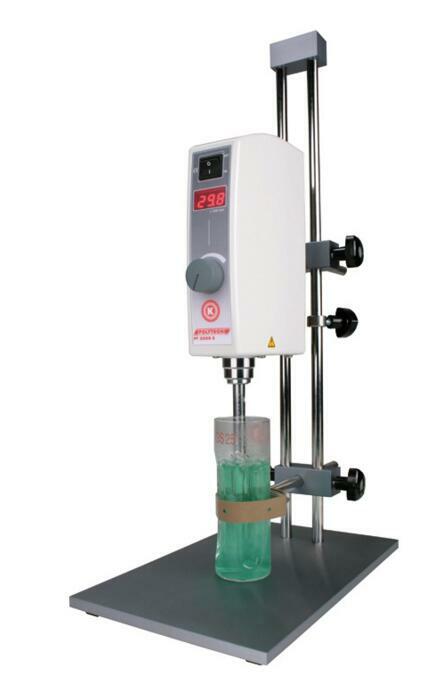 It is able to perform homogenizations with volumes from 0.05 to 2500 ml. The electronic control system continuously monitors the speed and automatically adjusts it, keeping it constant with changing viscosity. The speed is easily seen on the large digital display. Aggregates with a variety of styles and diameters are available to provide optimum particle size reduction when using this drive. There are many different styles of aggregates available from 3mm in diameter for volumes down to 0.01 mL to 12mm for volumes up to 250mL. If cross contamination from sample to sample is a concern, we offer single use synthetic aggregates in 7 and 12 mm diameters. One of the more recent additions to our line is the PT-DA 20/2 X EC aggregate which was specifically designed for homogenizing tablets. Vessel holders or anti-slip mats with our stands. Glass dispersion vessels which eliminate vortexing and improve homogenization efficiency.